A bacterial strain could be in commercial demand for its ability to provide health benefits and the easy technologies involved in its large scale production. Therefore, efforts are being carried out to generate efficient culture techniques that will ensure the high yield of cells without compromising the stability of the probiotics in food or other related supplements. Since, many of the strains of intestinal origin with probiotic efficacy are difficult to culture and in order to have an impact on economy and health they need to survive. Also, development of newer technological strategies could only lead to diversification of the strains that gives rise to more efficient product generation. Until recently, the large scale production of probiotic strains have been carried out using conventional culture techniques. Some of the favored techniques include batch fermentation, suspension culture. These have been frequently modified with the use of various stress factors at sub-lethal doses or the incorporation of a protectant to increase the viability of the cells. But other fermentation techniques like immobilized culture of the cells or the continuous fermentation techniques have been used in a limited number of cases which could increase the yield of the fastidious probiotic strains manifold. Some of the researchers have developed the technologies with fermentation for probiotic culture in recent times. The works of Lacroix and Doleyres have improved upon the fermentation methods, processing and the improvement in the endpoint utilization of the probiotic strains. Although the continuous culture of a specific strain is very difficult to maintain under industrial conditions with respect to contamination susceptibility and loss of physiological characteristics of the cells in due course of time. However, this technique could be particularly useful for the growth of the cells under specific stress condition as is evident for its useful application to culture Bifidobacterium strains. To improve upon this system, membrane bioreactors can be used for fed-back continuous culture where a limiting growth supplement can be continuously fed with a significant increase in the final yield of the cell density. Moreover, the use of membrane base systems can have the provision of customized pore sizes which will act as sieving systems to exclude out contaminants. In addition, only small molecules of the permitted size can diffuse through the system depending upon their size and as a result selective segregation of the metabolite and the cells can take place. Another added advantage to this fermentation process is that the cell fractions are harvested and needs very little or no downstream processing for an increase in cell density prior to being freeze dried. One important issue which needs to be addressed while dealing with probiotics is the sustenance of viability of the bacterial lives in its product form. 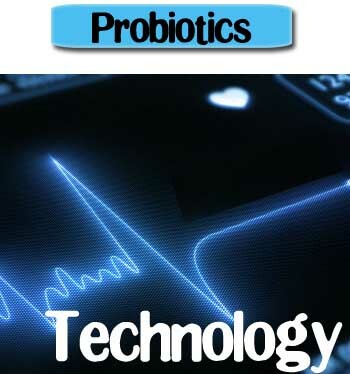 The probiotics are sensitive to a wide variety of factors-internal and external. Before the probiotic strains can be administered to the individual it has to withstand the high oxygen content which is toxic to it. e.g., the viable count of many Lactobacillus strains has been found to be reduced drastically when supplemented with yoghurt. Also, other stress factors like heat and acidity of the medium play a negative impact on the viability of the strains. Besides, such stress conditions may lead to the secretion of unwanted toxin like products which can adversely affect the health of the probiotic recipient. Even inside the human body they have to encounter a number of extreme factors that challenges its existence and exert its full fledged activities. Some of the internal factors encountered include low pH, the bile and bile salts, the pancreatic juice. The probiotics have to overcome these barriers in order to adhere and colonize the gastrointestinal tract and exert the beneficial activities like enhancement of immunologic responses, overgrowing the pathogenic microflora and thereby stimulating the beneficial effects to alleviate the disease symptoms in the patients. Several approaches have been adopted by the researchers and applied by manufacturers to enhance the sensitivity of the probiotics to such extreme conditions. The isolation and characterization of acid and bile resistant probiotic strains would not only be useful in the generation of such resistant bacteria but also lead to the incorporation of such resistant genes in other beneficial strains through genetic manipulations. Some of the scientists have used non-oxygen permeable coatings, making the bacteria more adapted to the stress conditions, microencapsulation, use of nutrients like amino acids and peptides with good effect to increase the lives of the probiotics. The protection of the bacteria from external environment till it reaches the target site within the host through the use of microencapsulation has captured the imagination of the scientific community and many such evolved techniques are now being contemplated. Among others, the group of Yildirim has provided sufficient insights to suggest the use of immobilized cell technology is highly efficient to produce good yields of both cells and metabolites. Newer culture techniques like the use of sub-lethal doses of stress factors when the cells are grown in biofilm state has been found to be effective in increasing the life span of the highly susceptible Bifidobacterium cells. The development of efficient modes of culture conditions for the production of probiotic strains with increased resistance to the lethal environment factors can only enhance the efficacy of the probiotic products. Emergence of recent trends in the culture and maintenance of specific beneficial strains augurs well for the future of the probiotic science.